This NBBD.COM-Titusville website contains programs, details and links that supplement and support the official website. • Background on the Community Conservation Education Center planned for the refuge. Details on 21 destinations in the Refuge & Seashore. April through October: open Monday through Saturday from 9 am to 4 pm. November through March: open seven days a week from 8:00am to 4:00pm. Roads, trails, and boat ramps are open daily from sunrise to sunset. $10 per vehicle. More information. 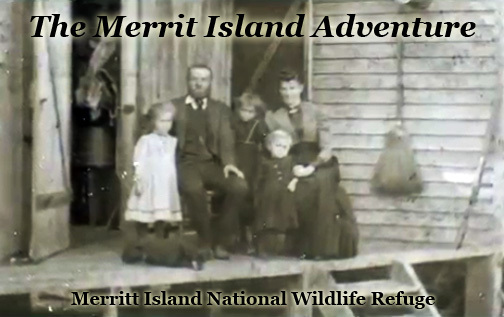 This video is a documentary of the lives of the homesteaders living on Merritt Island in Florida in the area that is now owned by NASA operating the Kennedy Space Center and also managed as Merritt Island National Wildlife Refuge. NASA used eminent domain to acquire the property in the late 1950's - 60's. Here are the stories of how people lived very primitively on the land and what happened when they were forced to move. For this film, they were brought back to the homestead, back to the very foundations where they still existed. Some early settlers are able to visit their home sites where the land is open to the public; however, some have never had access to their home site because it lies within the security area of Kennedy Space Center. Many residents are proud that their land went to support a successful space program that sent man to the moon! Although residents were forced to move, they are glad the land is protected as a National Wildlife Refuge and not developed like so much of the Florida coastline. The refuge remains pristine and very similar to how they remembered growing up there. CLICK HERE to go to the YouTube video. To report a refuge law enforcement violation please call (321) 227-0107 or toll free 1-888-503-1776 and leave a message. The message will go directly to the Refuge Law Enforcement Officers. In case of an emergency dial (321) 867-7911. Located on the John F. Kennedy Space Center, east of Titusville, Florida. 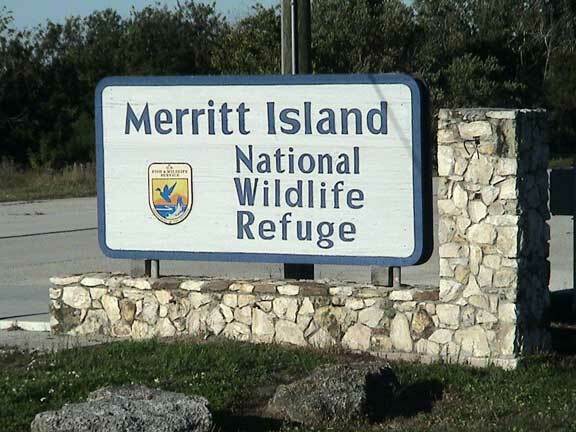 Merritt Island National Wildlife Refuge (MINWR) was established on August 28, 1963. The Refuge, managed by the U. S. Fish and Wildlife Service, provides a buffer zone for the National Aeronautics and Space Administration (NASA) in their quest for space exploration. Approximately one half of the Refuge's 140,000 acres consists of brackish estuaries and marshes. The remaining lands consist of coastal dunes, scrub oaks, pine forests and flatwoods, and palm and oak hammocks. 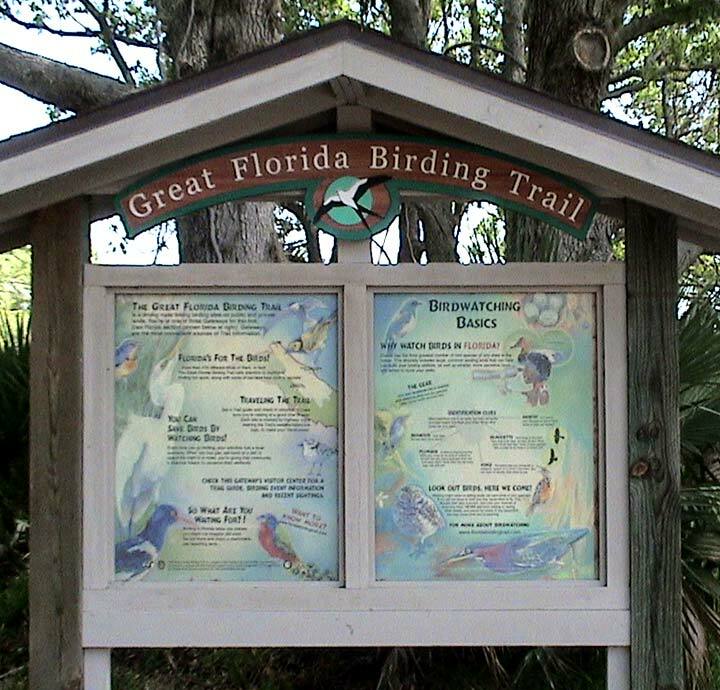 The refuge is a gateway to the Great Florida Birding Trail. The Refuge co-hosts the Space Coast Birding & Wildlife Festival each January. The refuge is part of NASA and the Kennedy Space Center. 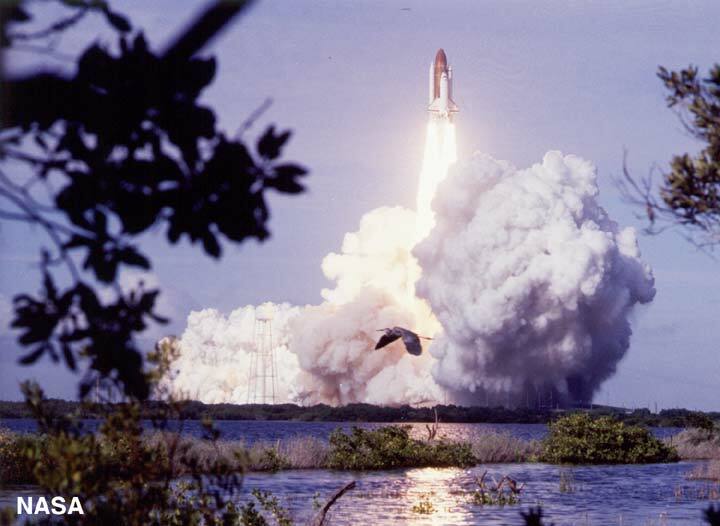 Portions are closed during the launch of shuttles. Click on the pictures to see a larger picture. to provide opportunities for environmental education, interpretation, and wildlife oriented recreation. Refuge Rangers provide educational programs in the Visitors Center and in the field. Private tour operators are licensed to give educational programs and outdoor experiences. Partnership ventures with organizations to like the Brevard Zoo to use Refuge facilities. The coastal location of MINWR, tremendous variety of habitats, and position between the subtropic and temperate climatic zones contribute to the Refuge's importance as a major wintering area for migratory birds, including 23 species of waterfowl. A total of 1,045 plant species has been identified on the Refuge. More than 500 species of wildlife have also been documented including 330 species of birds, 117 fishes, 65 amphibians and reptiles, and 31 mammals. Of these, 16 are currently federally listed as threatened or endangered. In 1994, a 10,500 acre no-motor zone was established in the northern Banana River. During spring months, up to 400 manatees have been observed using this area for feeding, breeding and cavorting. Public entry for fishing and canoeing is allowed from the SR 528 area just south of the zone. 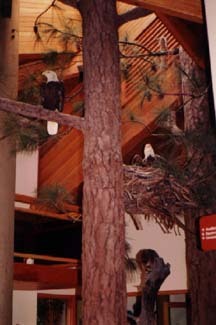 Ten active bald eagle nests were recorded during the January 1997 aerial survey. Since the early 1960's, an estimated 150 eaglets have fledged from Refuge nests. A record 107 green sea turtles nested on the Refuge in 1996. Also, 1,546 loggerhead sea turtle nests were recorded. 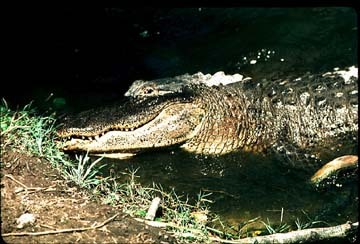 An estimated 5,000 alligators inhabit the Refuge. A project designed to entice wood storks to again nest on MINWR was completed in February 1997. Twenty-five artificial nesting platforms were constructed and placed in an historic nesting area where specific water level management objectives can be met to provide optimum feeding habitat. Refuge lands are open daily from sunrise to sunset, except for periods during shuttle launch operations. The Refuge normally closes at the Titusville entrance and just south of Haulover Canal on SR3 24 hours prior to launch. 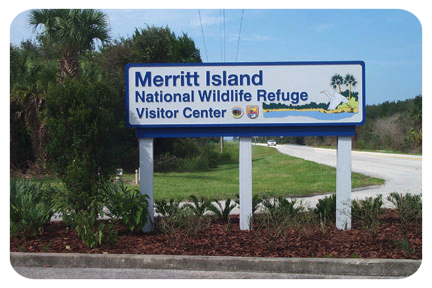 VIC - A Visitor Information Center - located 4 miles east of Titusville offers Refuge information, educational displays, wildlife exhibits, and a 20 minute video about the Refuge. A 1/4 mile, universally accessible boardwalk located behind the VIC crosses over a pond, through an oak hammock, and leads to a freshwater marsh overlook. Special interpretive programs are offered November-March annually. The VIC is open Monday-Friday 8:00-4:30 , and 9:00 -5:00 on Saturdays and Sundays (closed Sunday April-October). Black Point Wildlife Drive is a 7 mile, one-way , self guiding tour through impounded marshes. The drive offers several numbered stops which are described in a brochure that can be picked up at the entrance to the drive. 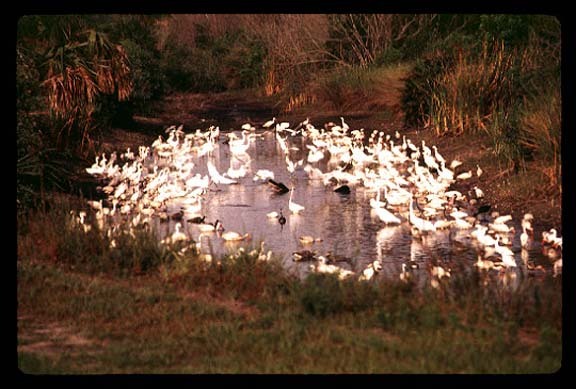 Wading birds, shorebirds, raptors, waterfowl, alligators, otters, and other species of wildlife frequent the area. The Cruickshank Tower located at Stop 8 offers a view of the surrounding marshes from a 10' tower. HIKING TRAILS - In addition to the Boardwalk Trail at the VIC, five other trails are offered: Oak Hammock Trail (1/2 mile), Palm Hammock Trail (3 miles), and Cruickshank Trail (5 miles). The Hammock trails are typically wet following periods of rain, while the Cruickshank trail (dike) is dry. 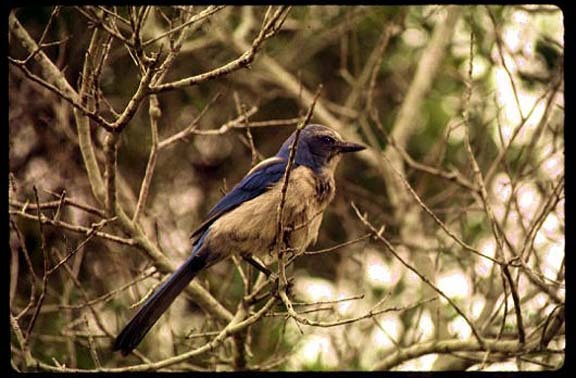 Newer trails include the Scrub Ridge Trail (Florida Scrub-Jays), the Pine Flatwood Hiking Trail (1 mile) and the Wild Bird Trail (1/4 mile). Bug repellant is recommended for all trails, especially from March - October. MANATEE OBSERVATION DECK - Located on the northeast side of Haulover Canal, this observation platform overlooks an area that is frequented by manatees. As many as 42 manatees have been seen here during spring months, however use of the area by manatees varies. Interpretive panels, a polarized viewer, and tactile panels are on site. Parking is available at the deck, and a ramp makes this facility universally accessible. Banana River no entry and restricted zones. Hunting for ducks and coots is allowed in accordance with state regulations in four specified hunt areas totaling 36,000 acres. A hunter safety card is required for all persons in areas 1,2 and 4. Persons hunting in area 3 do not need a hunter safety card unless they are required by state law to have one in order to purchase a hunting license. Hunting occurs on Wednesday, Saturday, and Sunday during the state set season, plus Thanksgiving Day, Christmas Day, and New Years Day. All hunting stops at 1:00 p.m. Common species bagged includes blue-wing teal, green-wing teal, pintails, widgeons, shovelers, scaup, and mottled ducks. Hunter check stations are frequently manned by Refuge personnel. See also our press releases. Merritt Island Wildlife Association - The support group of local volunteers who promote conservation, awareness, and appreciation of the Merritt Island National Wildlife Refuge and who provide assistance to Refuge programs. You are invited to join them. Refuge Volunteers - Opportunities range from staffing the Visitor Information Desk to trail maintenance, from Naturalists for interpretive programs to restoration projects. Since 1993, the Refuge has been involved in a multi-agency, multi- phase marsh restoration project. Seventy-six impoundments originally created from 1959-1966 to help control salt marsh mosquito populations are being restored to more original conditions by reconnection to near-by lagoons using culverts or by breaching the dike. This will enhance wildlife habitat, allow for greater species diversity, and control species such as cattails and willows which have invaded the impoundments. This project is part of the overall effort to protect and better manage the 156 mile Indian River Lagoon. MINWR has a very active fire management program. Each year, thousands of acres of upland and marsh habitat are prescribed burned to rejuvenate the vegetation, add nutrients to the soil, and control woody vegetation such as willows that invade impoundments. 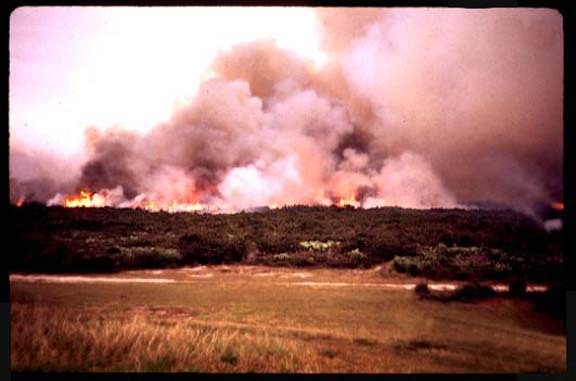 Fire is a very useful tool in managing scrub oak habitat where species such as Florida Scrub Jays, eastern indigo snakes, and gopher tortoises occur. Without fire, this type of habitat becomes too overgrown to successfully support scrub jays. Wildfires often result from passing thunderstorms, especially during summer months. These fires are controlled as soon as possible in critical areas, and are frequently allowed to burn in areas where prescribed fires were scheduled to be conducted. Firewise tips checklist for homeowners. Surveys are conducted for many species of wildlife including sea turtles, bald eagles, ospreys, wading birds, shorebirds, waterfowl, and alligators. Data collected on these species is used to determine use and population trends for management purposes. Merritt Island National Wildlife Refuge - The U.S. Fish & Wildlife Service Site. 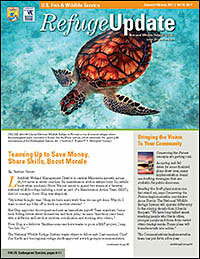 North Brevard Educational Resources - including several photo-essays on ecosystems and wildlife. Canaveral National Seashore Local website. Canaveral National Seashore Official NPS website. RefugeNET: helping to create awareness of & appreciation for National Wildlife Refuges.